It was in the first part of the war that my family fled to Amsterdam, Holland. My parents hoping to escape the Nazi regimen in Germany had packed a few belongings and silently left our homeland. I was fourteen, it was the winter of 1939 and Adolph Hitler had risen through the ranks and gained power. I had witnessed first hand the cruelty and insanity of his new world order. Jews who were my classmates and friends were beaten, tortured, and taken from their homes to concentration camps. Most of them I never saw again, not even after the war. We thought at first our decision was a wise one, but soon found out there could be no peace until the war ended. Holland had declared itself as a neutral country but soon realized the Fuehrer did not acknowledge neutrality. The occupation of Holland took place in 1940. I had just turned fifteen and the war we had hoped to leave behind soon caught up to us. For five long years my parents and I worked with the resistance. We prayed each day that help would come. In the spring of 1945 the Allied forces did arrive and freed Holland of the oppressive hand of the Nazi rule. I met Jacob that spring. He was in the United States Army. As his company rolled through Amsterdam I watched him riding in a jeep. His smile was what made me notice him. Jacob’s face glowed and he reminded me of an avenging angel. I never realized at that particular moment how right I was. Though he was barely a man of twenty four he had fought in many battles and led his troops to victory time after time. He had been wounded on numerous occasions and lived to tell the story of how God had spared him to free the people of Europe from Hitler’s tyranny. We met early that spring at a dance the people of Amsterdam had in honor of the American’s victory over the invading forces. I came to the celebration out of curiosity and the desire to perhaps see this young hero. I was not disappointed. We did meet and spent the night dancing and dreaming of a better world, a world that was at peace with itself and free of hatred and animosity. Time flew by quickly while Jacob was there with me. Friendship soon blossomed into love and we planned our future. I remember the day Jacob received his orders to ship out. The Americans were planning a massive invasion; one they felt would end the war swiftly and efficiently. We met by the old windmill just outside of town. It had become the perfect spot for us to share our moments together. The ocean of tulips surrounding us made me think happy thoughts, but I knew from the look on his face that something was wrong. When I asked him what had happened, he told me. I could hear the regret and sadness in his voice. I tried to be brave and smiled. 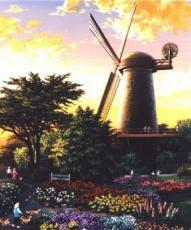 We held each other for a very long time and swore to meet again there at the windmill when the war was over. We also promised to write each other daily. It was a promise I kept. As he left the next day I watched with a heavy heart. I prayed God would keep him safe and that he would return to me. With Holland free to live in peace, I finished my education and became a teacher. Each day it was harder and harder for me to concentrate on life around me. I would listen to the radio and scan the newspaper continuously hoping to read that the war had ended, hoping to find Jacob waiting for me at the old windmill. I wrote letters daily and hoped they would reach my love, wherever he might be. Jacob would send me letters as well. Sometimes with the mail being disrupted by the war I might receive two or three of his letters at a time. I poured over each word and saved each precious note he penned. In late spring of 1945 the war ended for the people in Europe. Hitler not wanting to be punished for his crimes against his fellow man killed himself. I waited impatiently for Jacob to come back to me. Every day I grew more restless and heartbroken. The letters he had been sending faithfully stopped. The steady stream of well wishes and words of passion dried up like a thirsty creek bed through a drought. My mind became my worst enemy and I started to believe Jacob had forgotten me and his promise. Still I walked each day to our designated rendezvous thinking today he would be there waiting. So many times I went with high hopes and aspirations and each time my heart grew more cynical and concerned. I did not know that Jacob had been severely wounded in the last battle he and his troops had been engaged in. Had I known he was injured I would have gone to him immediately. Instead I imagined Jacob was either dead or had chosen not to return for whatever reason. My parents who had become concerned about my obsession with Jacob began to hint to me that perhaps it was time for me to live my life. After all he was probably in America with a family of his own. Try as I might I could not help but feel that something earth shattering had happened to Jacob. Why else had he not returned? It was early spring of 1948. Two long, lonely years had transpired and still I ventured down the road late in the evening. I remember the tulips were just starting to bloom. I walked as if in a dream. Remorsefully I took in the beauty around me, but my heart had become stone, nothing could move me. A last cool breeze of late winter caused me to pull my sweater around me. I told myself this would be the last time I would make the trip. Wishing with all my heart and soul Jacob might return I traveled the road slowly. In the distance I saw a figure standing and waving. I could not tell who it was at first. Perhaps it was the farmer who owned the windmill or a friend of mine. I could not tell immediately who was waiting there. I walked on and soon saw the man running toward me. As he ran I could tell one of his legs was impaired, for he had a funny gait. All too soon it became apparent to me; the person that was fast bearing down on me was Jacob. How my heart sang with joy. I picked up my own pace and was soon in his arms laughing and crying. The first kiss we shared since last we parted was the sweetest. If I live to be a hundred I will not forget that moment when my world started again. Nothing since then has brought me the elation and happiness I experienced at that moment. We were soon married and I returned with Jacob to America. We sailed into New York harbor and I caught my first glimpse of the Statue of Liberty. My mind reeled as it realized the true meaning of liberty and one’s pursuit of happiness. I write this for the generations who come after me so they might better understand the importance of faith and the need to fight for what you believe in. If not for Jacob’s desire to fight for freedom of the world, we would never have met. © Copyright 2019 Mistress of Word Play. All rights reserved. You did an amazing job on this dear lady. I can just see this happening. I am sure there were such things which did in fact occur just as you described it in your story. A very beautiful tale you told it magnificently. Good show! You did a brilliant job on this one. Great emotions and what a story. Good luck dear friend you did fantastic. Oh this was so beautiful. I liked the story of how the met and feel in love. I also enjoyed the part about when she sees Lady Liberty. Great job! Beautiful write my friend. I just loved this one. Good luck dear Susan. I hope you win. My grandparents met this way through the war. I liked this story. Nice job. What a wonderful story I could see it all unfold before my eyes, I have heard of similar true stories thta have happened, you did a great job here like it! and I realized I hadn't even commented! Must have run out of time! Great job! Results should be up soon! This page was created in 0.3540 seconds.